Not All Home Inspectors Perform Termite Inspections. 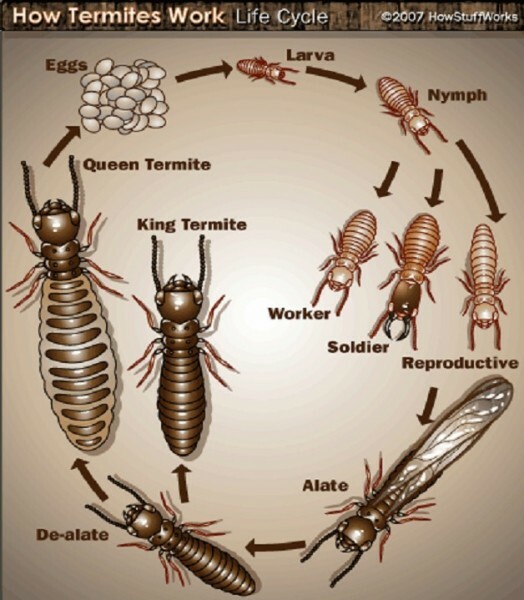 Primary termite reproductives are the king and queen, the swarmers that started the colony. The king and queen mate periodically, and the queen may live as long as 25 years. Primary reproductives (king and queen) range in color from honey to black. They are about 1/4 to about 1/2 inch in length. The male and female mate for life and are responsible for producing eggs that become the workers, soldiers, and future alates of the termite colony. Supplementary termite reproductives are produced in mature colonies or within groups of termites at distant feeding sites. They have light colored bodies. If the primary queen dies, the supplementaries can take over. A mature termite queen can lay thousands of eggs each year. During the two-week incubation period, eggs are tended by the worker termites. The nymph hatches directly from the egg. Attendants feed nymphs regurgitated food for the first two weeks, enabling them through molting to become workers, soldiers, reproductives, or supplementary reproductives. As the reproductive termite nymph matures, its body lengthens and sexual organs develop. The body turns black, eyes become functional, and wings extend twice its body length. All the mature termite reproductives leave the colony at the same time, usually in the spring and sometimes in the fall. Swarmers are poor fliers and, when above ground, usually flutter a few yards and fall. Swarmers, emerging outdoors from tree stumps, railroad ties, etc., are usually not of concern and are in no way an indication that the structure is infested. After dropping to the ground, they shed their wings. Surviving males find compatible mates and then burrow into the ground to become king and queen. 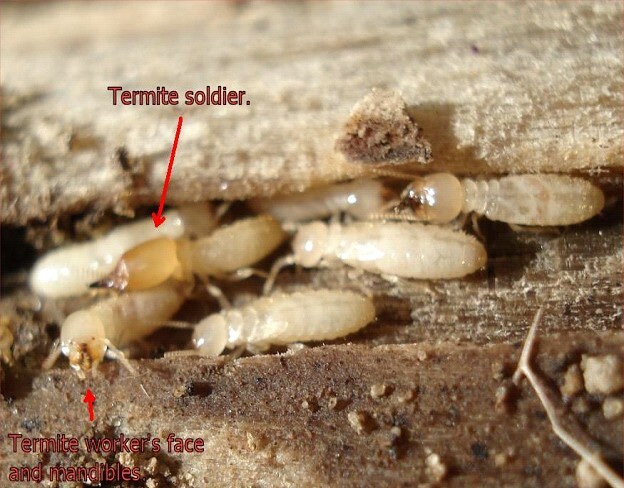 These termites live in nests underground and tunnel up for food, which includes the wood under-structure of homes. A very small percentage of swarming termites survive to initiate new colonies. Many are eaten by other insects, birds, etc. Likewise, swarms emerging inside a structure usually never survive. However, it is an indication of infestation. Swarmers have straight, bead-like antennae, a thick waist, and a pair of long, equal-length wings, that break off easily. The presence of winged termites, or their shedded wings, inside a home should be a warning of a termite infestation. 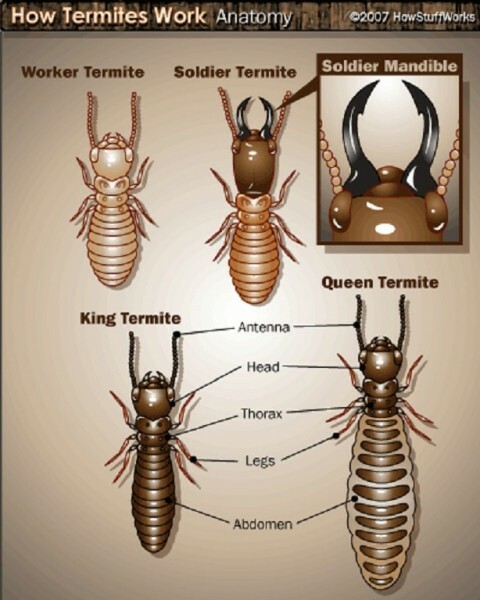 The King and Queen termite are central to any vibrant termite colony, with the Queen acting as an egg-laying machine producing between 2,000 and 3,000 eggs per day. The Queen can live for 25 years. This caste provides all of the labor for the colony including searching for and collecting food, feeding all other castes and immature’s , grooming others within the colony, cleaning, maintenance and building for the colony. Alates are winged, reproductive’s that fly from the nest in their thousands, eager to establish a new colony. Because Alates are poor flyers they generally only fly some 50 – 100 meters from the parent nest. As such when observing flying Alates you can generally assume a termite nest is near-by. These are winged reproductive termites (swarmers). Subterranean termite alates are day swarmers. After swarming, these termites drop their wings and look for a nesting site. Swarms usually occur in the morning after a warm rain. 1. Don’t affix wooden trellises to exterior walls. firewood outside your house during the winter, keep it raised off the ground. from the foundation as well. 4. Don’t bury wood debris near your home. 5. Remove infested trees and stumps. 6. Repair leaking faucets and water lines, both indoors and outdoors. 7. Fix leaky roofs and gutters. 8. Don’t allow leaves to accumulate in gutters and drains. 9. Grade soil so that water (including air conditioning condensate water) runs away from foundations. 10. Ventilate crawl spaces and attics to reduce humidity. 11. 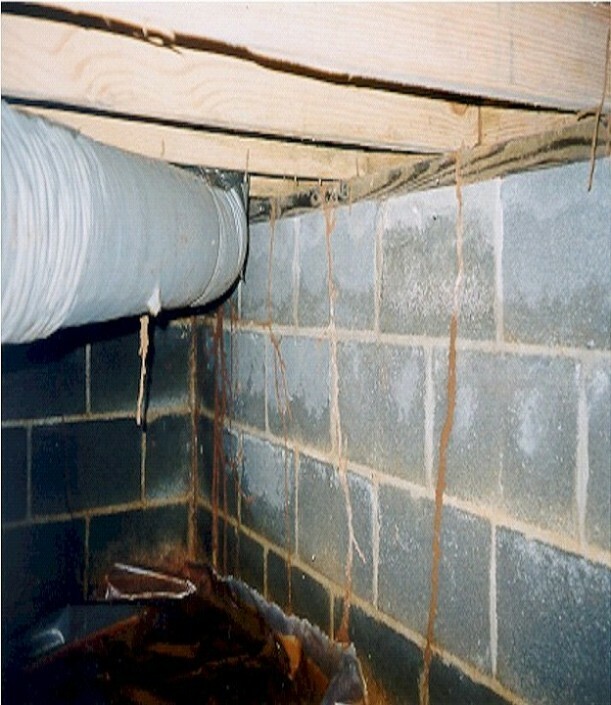 Cover at least 90% of the soil in crawl spaces with plastic sheeting. 12. Ideally, wood siding, stucco, and foam board should be at least six inches away from the ground. Carpenter ants are important decomposers of forest trees, burrowing within it to nest and feeding on insects, plants and fruit juices. However, they do move from their native woods to the structures of homes looking for water and human or pet food. Although they are slow to cause harm, carpenter ants can do serious damage to a home if they are not adequately controlled. Fortunately there are several least-toxic options to control carpenter ants once they have been properly identified. Carpenter ants have humped backs, are about ½ inch long and are black with gray, yellow or red hairs on their body and legs. As these ants are commonly misidentified, consult your local university entomologist or Cooperative Extension Service agent if you are unsure whether carpenter ants are infesting your home and yard. Frame houses without basements and any building near a forest are likely locations for a carpenter ant nest. These nomadic ants love areas of high moisture so inspect bathrooms and kitchens and anywhere water leaks are occurring, for wood dust or shavings. Outdoors, tap on evergreen trees and hollow stumps within 300 feet of your home. Use a stethoscope or empty glass to listen for rustling sounds. Gently tap joists and rafters with a hammer, listening for rustling or for the hollow sound of excavated wood. Insert a pocketknife blade into wood to confirm your suspicions. Boric acid is used to destroy indoor nests and if kept dry, can be effective up to 30 years. Although it is non-toxic to human and pet skin, a one-micron dust mask, neoprene gloves and safety goggles should be worn to avoid inhaling or ingesting the fine dust. Desiccating dusts, such as Diatomaceous Earth (D.E. ), and Silica Gel, destroy insects by absorbing their waxy outer coating, causing them to die from dehydration. D.E. should be blown with a bulb duster behind electrical switch plates and into wall voids. Silica gel combined with the natural pesticide, pyrethrin, is available in aerosol cans and should be sprayed into the same areas as D.E. Alternative, but not readily available controls, include microwave radiation, heat treatment and electrocution. Check your telephone book or the Internet for contractors in your area. Borate treated lumber must be used in any home construction or remodeling. All siding and foundation holes must be sealed and rotted wood replaced, especially next to drains and gutters. Cap with metal any wood that contacts soil and store firewood outdoors.